"[Just] as her heroine learns to wield a bow and arrow, Chokshi has her own weapons: a skill for crackling prose, and a main character who, despite her lies, is both endearingly funny and self-aware....With Aru at the helm, this roller coaster through Hindu culture never feels forced or pedantic, but instead like a new kind of myth — where a hero takes a hammer to the world to shine a light through its cracks." "In her middle-grade debut, Chokshi spins a fantastical narrative that seamlessly intertwines Hindu cosmology and folklore, feminism, and witty dialogue for an uproarious novel for young readers...Chokshi comes into her own in this novel, reminding readers of the power of language and of stories." 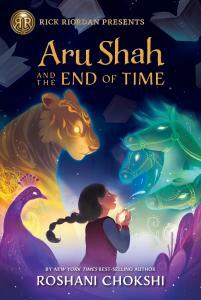 "[Aru Shah and the End of Time] expertly channels the humor and action that have made Riordan's own work so successful...Chokshi weaves an engrossing adventure that will leave readers anticipating the next installment." "Readers will be delighted by this adventurous dive into Hindu mythology and the chance to cheer along a heroic young protagonist....This series starter also doesn’t skimp on important lessons about friendship, family, and love. Chokshi is a talented writer who breathes fresh air into her mythological world. " "Using Hindu mythology as the foundation, Chokshi has created an exciting adventure around a coming-of-age tale...An enthralling start to a series that Riordan fans and anyone in the mood for a high-octane adventure will love." "Hilarious and brilliant—full of wit, warmth, and wonder. Aru Shah is a clever, believable heroine who deserves her place with all the great heroes of legend. I'm so happy this book exists—and that there are still more to come!" "Warning! This book contains mind-bending myths, dreadful demons, and more swashbuckling high adventure than can possibly be good for you. Oh, and one of the sassiest heroines ever to walk into an elephant's mouth. I loved it. I think you will, too." "Welcome to the weird, wonderful, and utterly fierce world of Indian mythology! You have beasts, monsters, demons, magic weapons, and the new-to-the-saving-the-universe heroine Aru Shah who, in the very best traditions of heroic adventure, will have to deal with them all—and with a mentor in the guise of a pigeon called Boo. (Seriously!) Roshani Chokshi has done a brilliant job of capturing the essence of what makes Indian mythology unique, and you’re in for an awesome ride. Cannot wait to find out where she’ll lead us next!"